Tastes as good as it looks. All the "hard" work is in the prep. Cooking is fast. I hate it when a bag of bean sprouts spoils in my refrigerator. 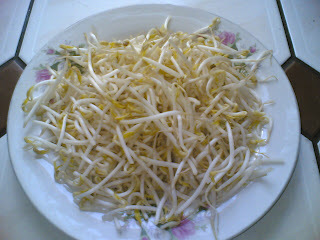 I hate it when any food does, but bean sprouts are particularly disgusting when forgotten. Sometimes I think refrigerators should be from floor to ceiling, but only 12 inches deep. Nothing would be able to be pushed to the back. Bean sprouts seem to automatically be drawn to the dark recesses of my refrigerator. So I swore to myself that would not be the case this time. I had an opened bag from my recipe yesterday, and needed to move quickly. Bean sprouts seem to spoil in about three days. How they keep them in stores is beyond me. I also had a piece of beef (buy what's on sale and you invariably buy more than you need for one meal) and was nearing the bottom of my bottle of hoisin sauce. Those were my starting points for dinner. All I had to do was find something that fit the bill. It didn’t take too long, although tasty recipes with beef and sprouts are a little less common than one might think. I found a suitable base recipe and added and subtracted ingredients to fit what I had on hand. The result is the subject of this post. This was good, to say the least. We both went back for second helpings. That's code for "what should feed four fed two of us" (pigs that we are). I also was able to get rid of some stuff in the ‘fridge that otherwise would still be hanging around… Bonus. 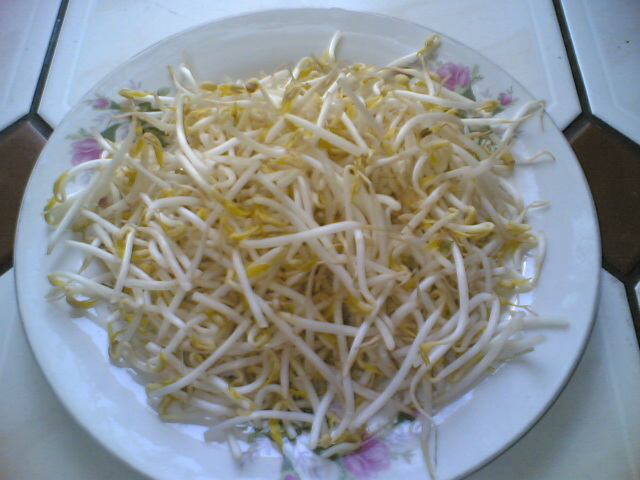 Most commercial bean sprouts are mung bean sprouts. Of course you can make your own quite easily at home. It’s not rocket science. Google for how to do it. One cup of raw mung bean sprouts contains only 31 calories and 3 grams of protein. One cup also contains 43 percent of the recommended daily value of vitamin K, 23 percent of the daily value of vitamin C, 16 percent of the daily value of folate and 10 percent of the daily value of manganese. Sprouted mung beans also have smaller amounts of vitamin B6, niacin, riboflavin, thiamin, pantothenic acid, iron, magnesium, phosphate, potassium, copper and zinc. The sprouts have an amino acid score of 67 out of 100, meaning they do not contain all nine of the essential amino acids that make up protein. However, consuming other foods with amino acids will compensate. Cooked bean sprouts – even stir fried – contain slightly less of all the above nutrients. 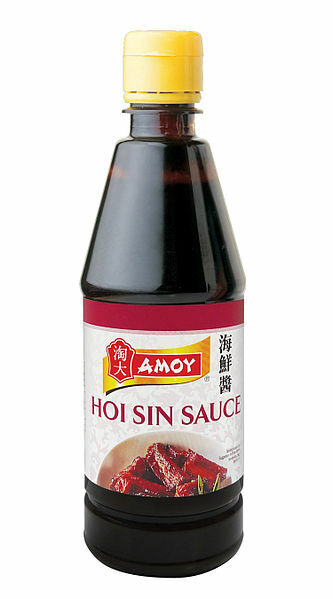 Hoisin sauce is a thick, dark sauce used as a dipping sauce for dim sum, as a glaze or marinade, or is simply added to many Asian dishes as a flavour enhancer. The ingredients vary, but its basically soybean paste, salt, sweeteners and spices. A starch helps thicken the sauce. 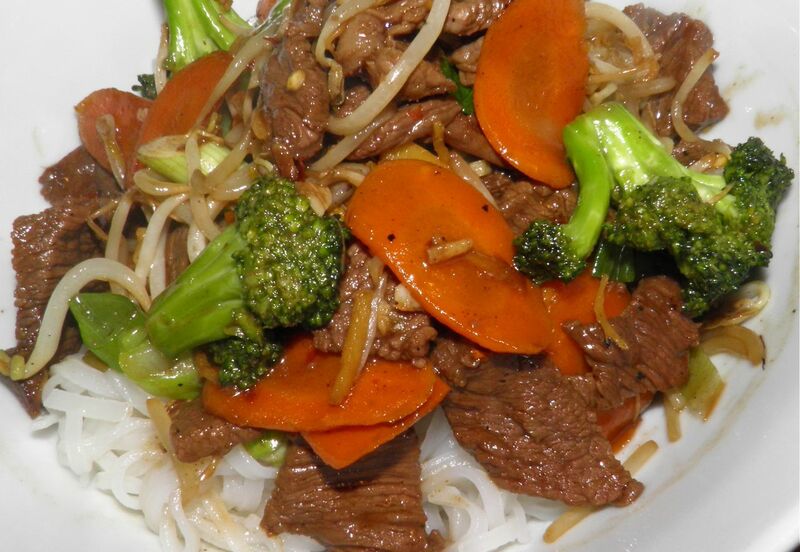 The taste of hoisin sauce is sweet, salty, sometimes spicy – and amazing. It is has a unique flavour, and some say it's an "acquired" taste. I have no idea why. Personally it’s a taste I’m glad I discovered. But back to the recipe... As with most stir fries, much of the time is in cutting up the ingredients for cooking. From there it goes quite quickly. If you're short on time but long on bean sprouts try this recipe. It's an excellent way to use up that ingredient in a one pot, main course meal. Slice the beef thinly across the grain. Across the grain makes it more tender once cooked. Chop the garlic and ginger and set aside together. Chop the carrot and place it with the broccoli florets in another bowl. Slice the green onions and set aside. 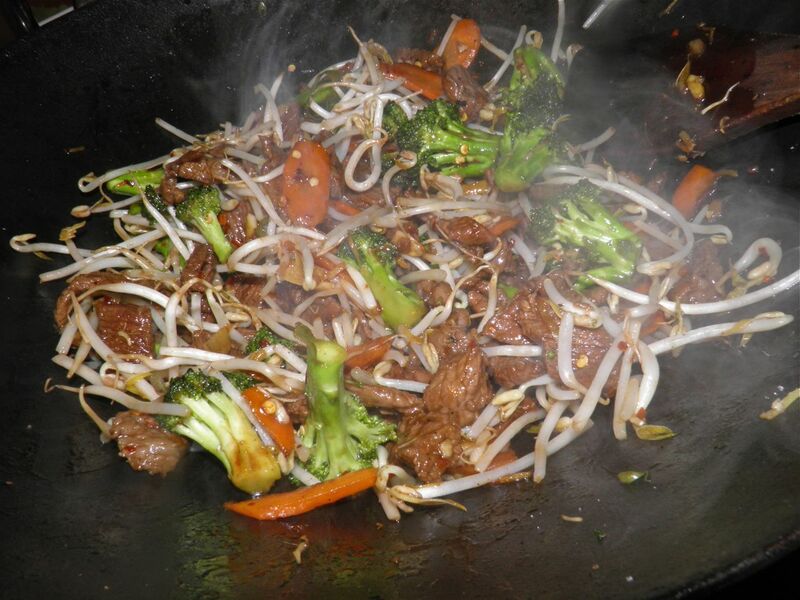 Place 1 tbsp of the oil in a wok and heat until water droplets sizzle when sprinkled into the pan. Add the beef in batches and fry until just no longer pink. Remove to a bowl as you cook. Pour the sherry over the beef. After all the beef is cooked add another tablespoon of oil to the wok. Stir fry the garlic and ginger for 30 seconds. Then add the carrot and broccoli. If necessary, add the final tablespoon of oil. Cook until the carrots soften slightly, about 3-4 minutes. Then add the beef and toss well. Add the soy sauce, hoisin, sugar and chilli flakes and toss well to coat. Then add the bean sprouts and green onions and toss again to combine. Let the bean sprouts heat through, but remain crisp. 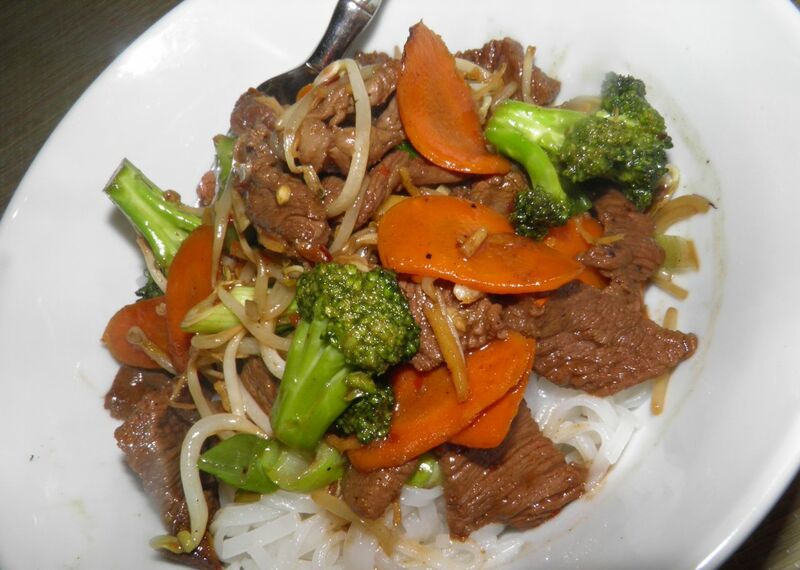 Then serve immediately over the rice vermicelli.